So far it’s been a quick knit. Two evenings knitting while watching a movie and I’m finished with the hat body. You can see I am starting on the protruding ornamental drumsticks. Chicken Viking knit up with no problems. I worked the whole thing on DPNs rather than a small circ. Newer knitters attempting this one should remember that “continue in pattern” means that as the decreases that make the crown happen, the placement of the one-purl goosebumps should follow the established distribution and spacing, even if the decreases eat into the beginnings of the repeat sequence. 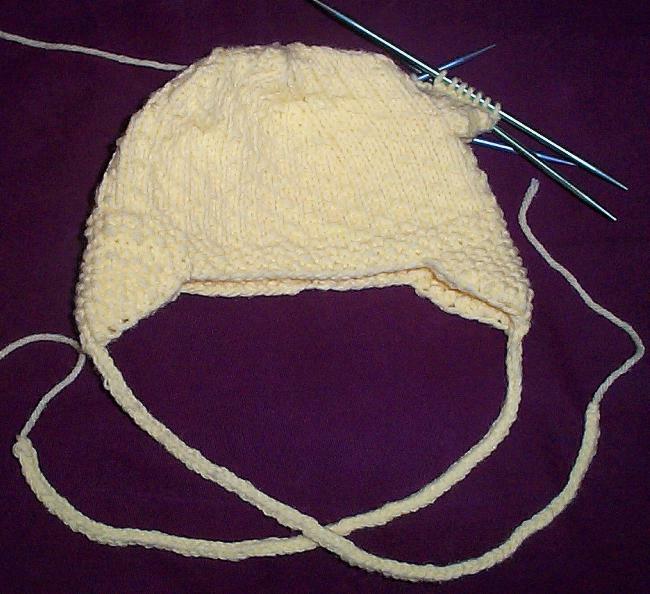 As a result post-decrease rows won’t begin at the specified spot described in the goosebump stitch pattern sequence. But the pattern is extremely simple and figuring out the right place to begin won’t be a problem. My only departure from the written pattern so far is that instead of ending off the ear flaps by binding off the last four stitches, then attaching some strands of yarn to braid to make the ties, I reduced those last four down one final time to two stitches, then made my hat strings by working a two-stitch I-cord of requisite length. It came out nicely, sort of like lucet cord, I-cord’s ancient cousin. On the materials, nothing special here. I used remnants of a mass market 100% acrylic, in the “grade inflation” weight that is labeled worsted but has a natural gauge of 18-19 stitches = 4 inches. I did this because I wanted to make sure the thing was absolutely washable, and because of the heft of the yarn. This stuff has heft. The drumsticks will stick out on their own. A cotton as recommended would work well, too but most wool blends and all wools would make soft, droopy drumsticks. So it’s Soylent Green for this project. I expect to knock this hat off by mid week, even allowing for the severely decreased knitting time that accompanies deadline crunches at work. Stay tuned. LOVE the Viking Chicken Hat! Sounds like a wonderful fit, indeed. I clicked on your link to the Soylent Green yarn review. ROFTL! I had to print it out to stick in my knitting notebook. I plan to read it to DH as well. It sounds like you or the Resident Male — just your styles. Sure it isn’t you? If not, you’ve found a wonderful partner-in-crime.